So…I think we lucked out with this baby. He’s slept through the night (meaning at least 4-5 hour stretches) almost since birth. The latest is that he’s started to wiggle out of the tightest double swaddles, which is great actually because it seems he is gently weening himself from them. Last night, for instance, he was out of the swaddle with both arms by 12:45am, and was wide awake, although not crying, nay, HE WAS TRIUMPHANT, and it was all I could do not to play with this smiley, cooing boy who was reaching for my face with his proud little baby arms. Instead, I silently took him from the co-sleeper, nursed him, and put him back in the co-sleeper full and drowsy, but not asleep and let him “work it out.” He was not crying, but was definitely awake and talking. He fell asleep but woke again at 2:45am, which is not usual for him but I’m guessing he woke himself up because he wasn’t swaddled. He made some half-hearted attempts at grousing, but I did not stir. I wanted to see if he could soothe himself back to sleep, and he did. Until 6am. Bravo. I am very paranoid (Projecting Sue) that he will not be able to take a decent nap without the swing, and with a max weight of 25 pounds, our days are numbered. Today, I nursed him and put him into the swing, but didn’t turn the swing on (good first step?). He slept for about 15 minutes, then woke up and started playing with his blankie. 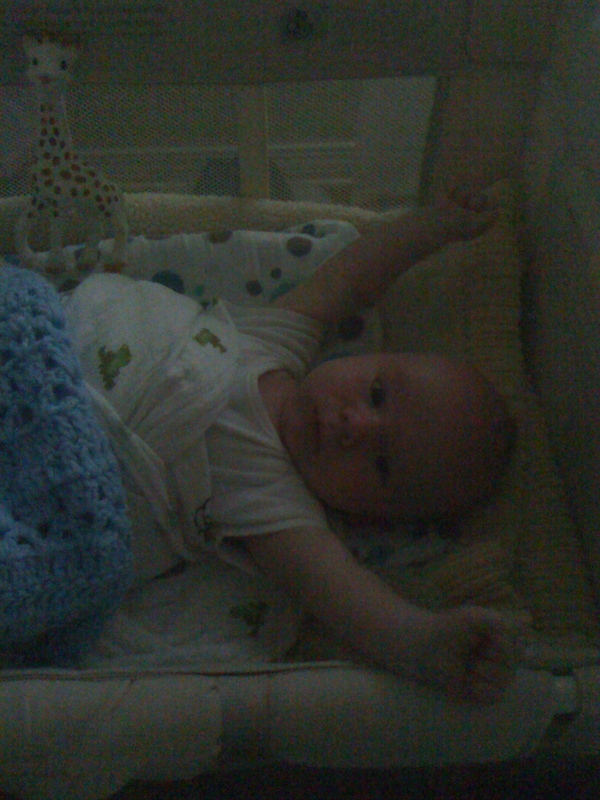 I was tired, so I cranked the swing on so I could pass out (lazy mama-but I’m still fighting a cold-that’s my excuse). You may just have to have a few rough days where he doesn’t nap well. We did that when we transitioned Lucy to the crib for naps and also when we stopped swaddling her for naps. It was rough as she adjusted but it only took a few days.